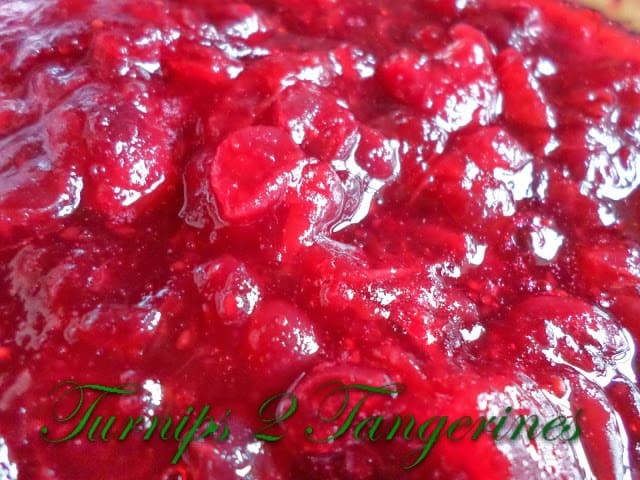 Cranberry Sauce…Its not just for Thanksgiving anymore. Cranberry sauce is a great accompaniment to grilled meats. This holiday season when you can find an abundance of cranberries in the produce department of your favorite grocery store, stock up!! Cranberries freeze better than well, just toss the bag of cranberries in the freezer. This grilling season, make up a batch of cranberry sauce and serve it alongside grilled meats. It’s time to enjoy this spunky sauce year round. We love cranberry sauce. In my house, we eat it throughout the winter months. We like to serve cranberry sauce alongside grilled chicken, pork tenderloin or duck. This recipe for cranberry sauce is so easy to make…from start to finish, it takes about 20 minutes. We like our cranberry sauce on the tart side, so we prefer to make cranberry sauce with lemon or tangerine juice or zest but orange works fine too. Change things up!! Next time you make a batch of cranberry sauce, add a few spoonfuls of orange marmalade. Another fun way to add flavor and color to homemade cranberry sauce is to add dry jello gelatin to the mixture. Try different flavors of jello besides orange such as raspberry, cherry, black cherry, or cranberry. Another trick or tip; use different flavors of juice when making cranberry sauce. Cran-raspberry is one of our favorites. Experiment with flavored liqueurs and wine too. Go Crazy!! Try it on..whole berry cranberry sauce is great spooned over rice pudding, spread on bagels with cream cheese and even spooned over ice cream. Add cranberry sauce to pie filling for a new spin on pie. For a quick and delicious appetizer, spoon cranberry sauce over a block of cream cheese. Bring juice and sugar to a boil in a medium saucepan. Add cranberries and return to a boil, reduce heat and boil gently for 10 minutes or until cranberries pop. Stir occasionally. Pour sauce into a bowl, cover and cool completely at room temperature. Stir in walnuts if using. And it's easy-to-make, I like it! This looks delicious! Thanks for stopping by our Link Up party! This is so pretty and simple to make. I'd love it if you linked this to What'd You Do this Weekend. Wow, I want to try this! Mine looks plain compared to this! Love it!